D. X. Logan was born in July of 1979 in Trenton, Ohio but grew up most of his life in Middletown, Ohio. He always displayed an overriding interest in all things creative and in the outdoors. In the second grade he finish the novel Golem in the Gears by Piers Anthony and it was the first full novel he'd read on his own. A love of the written word had already developed in a way anyone could readily see. The works of such authors as Piers Anthony, Steven Brust and Robert Jordan, as well as many classics, were quickly used to feed an appetite for stories. In High School, D. X. Logan became involved in roleplaying games, finding that they were an outlet for his desire to draw into the mindset of a character. It also offered a lot of practice on expanding a character's background information. Understanding how the past affected their present actions became a valuable tool in a growing arsenal of writing tools. In 1998, he achieved the highest rank in the Boy Scouts, being named Eagle Scout, shortly after becoming an assistant Scoutmaster in addition to being an instructor for the survival merit badge. Later that same year, he began attending Miami University, majoring in Early Childhood Education with a focus in family social work. Despite graduating with a Bachelor degree, he did not move into the teaching field. Since then, he's lived in Pennsylvania, Maryland and Mississippi learning the ins and outs of many different types of job, each of which offers insights and inspiration for the development of stories. Having hiked over 8000 miles, including doing almost 2200 of them as a continuous trip in 2006, a fair bit of knowledge on the subject has been gathered. The year of 2006 was a hike of the Appalachian Trail. It is a footpath spanning from Georgia to Maine. The hike was completed under the moniker of Sir Lancelot the Brave. The trip took nearly six months and offered a lot of perspective on life. The trip also served as the major inspiration for Hike Not Alone. 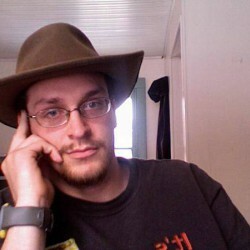 On returning from the Appalachian Trail, D. X. Logan began researching on Roleplaying Game design, crafting several games. This included the E-publishing of an alpha test version of a game called The Cursed under Boundless Allegory Designs. It was offered for free release as a playtest version. The beta test version of the game was released in 2011. A second, much larger game has been largely researched, but is slow in development in favor of a focus on other creative works. This larger game, working titled Myriad is slated for further development and future publication. March 17th of 2008, he was married and has since had a daughter and a son. The author currently living in Harlingen, TX where he is working on both his writing and his day job. When spare moments appear, they are used to work on writing articles and progressing with his first novel. D. X. Logan's current published works include The Cursed RPG beta, a number of online articles and may soon include Hike Not Alone.